Quite incredible after putting in all the time and energy into making a modified Systempro... and then goes the universe and puts one right in front of me! It was not in this condition when I received it of course, and with getting lucky with the weather over the weekend that I took her home... I went ahead and stripped out the 486 insides and gave her a good clean. She was loaded inside with all sorts of goodies... full complement of memory, original Connor HD's, EISA graphics card. Still, with all the spares I have floating about... I of course made her into another 386 to play alongside her little sister. Will be bringing one of the girls back down to where i'm working... i'm in a new city, so it'll be good to have some computer company! Since writing last I’ve managed to escape from work long enough to play with, and conduct some tests. 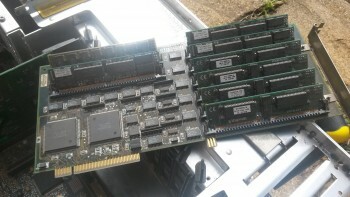 I have also taken some memory from a Deskpro I have and upgraded the system to 80MB DRAM (10 x 8MB sticks) all 80ns. I have a couple of faster sticks shown below which I have swapped over into the Deskpro, there is little point in having only 2 or 3 (60ns / 70ns) sticks being faster than the rest… it made sense to use them in the Deskpro which has lower memory demands. As with the modification system I did... I again upgraded the FSB = de-soldering the original 66.66MHz crystal and solder in a new DIL socket so that crystals can be interchangeable depending on system reqs. In this case, I have inserted an 80MHz crystal to bring the FSB up to 40MHz. So, the tests. Before I go on I should say that the normal benchmark software most folk here on Vogons use do not work unfortunately under Windows NT 3.1, only DOS. Multiprocessor performance is only possible under a supporting OS which DOS is not. 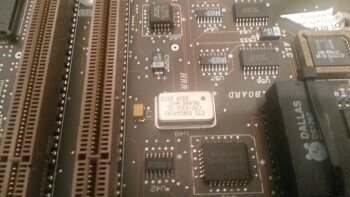 It is because of this that the DOS benchmark tools will only see and perform against one of the 386 CPU’s. If anyone can recommend any Windows benchmarks that are likely to run under NT 3.1… I’m all ears. Last edited by 386_junkie on 2017-6-03 @ 14:06, edited 31 times in total. 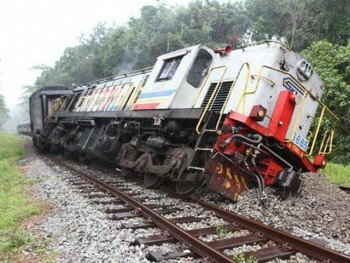 That is a fantastic looking machine! Looks really impressive. Good luck with the new job and city. Great job! 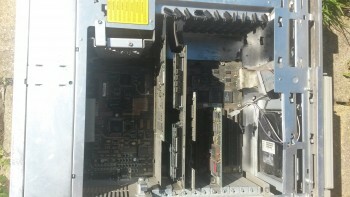 Do you know what is the purpose of all these small slots on the motherboard? what cpu config you have on the cpu riser? What about the ram too? I think it was meant to run netware 3 or maybe sunos ? It was very interesting to document myself about that computer, I did not knew such things did exist. Well, it's kind of the ancestor to a dell gxpro200. Got myself a Prosiginia 500 with a 486 dx33 and of course its fully EISA. 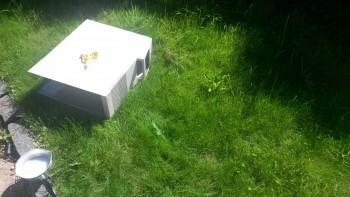 Had anotherone many years ago that i put a 486 dx4 100 in, but regretfully i recycled it. Congratulations on finding one! It a beauty! I don't believe SunOS was ever released for an x86 platform [ed. Wiki proved me wrong]. Solaris was, but that's not the same. BSA Starfire wrote: That is a fantastic looking machine! Looks really impressive. Good luck with the new job and city. Thanks. Really pleased I found her... still having to pinch myself to believe she's actually here. I brought her down with me with a bunch of other stuff moving in over last weekend. The new job has been very demanding... travelling all over England from Liverpool, Sheffield and this week Birmingham. Though now she is my sole flatmate, we will spend more time together! How did you get on with your IBM 386? 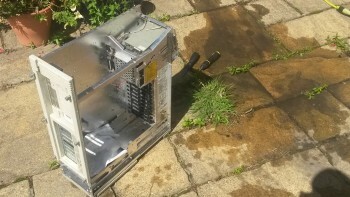 Did you retrofit / customise a case for it? GL1zdA wrote: Great job! Do you know what is the purpose of all these small slots on the motherboard? Thanks, there's much more to come... I hope to share all my findings with those who are interested. 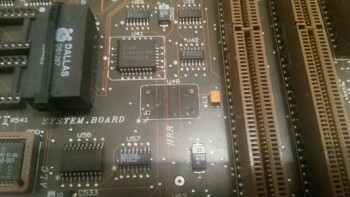 On the 386 motherboard, the first two slots are for CPU's / cache, the next two slots are proprietary interfacing for the DRAM cards both system and expansion, and the rest are all EISA. 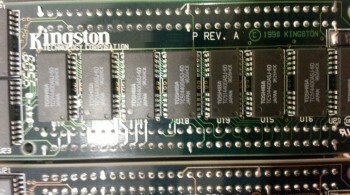 The whole system including the expansion slots (EISA and proprietary) are all 32-bit. ElBrunzy wrote: what cpu config you have on the cpu riser? What about the ram too? I think it was meant to run netware 3 or maybe sunos ? It was very interesting to document myself about that computer, I did not knew such things did exist. Well, it's kind of the ancestor to a dell gxpro200. 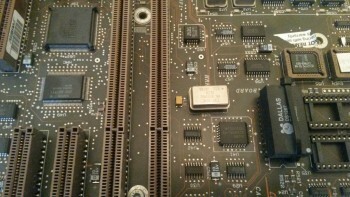 Both risers provide interfacing to two 386 CPU's... either 2 x AMD DX-40's, 2 x TI486 DLC-40's... or 2 x TI486 SXL2-50's. 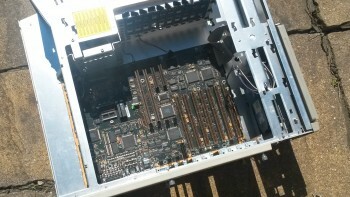 Both risers also have 2 x 385's controlling on-board cache, as well as 2 x 40 MHz Cyrix 387 FPU's. Memory is proprietary and is limited in terms of upgrading, but the maximum the system will take is 12 x 8MB = 96MB DRAM in total. I already have Windows NT 3.1 on the first Systempro I built and will be installing it on this system later today if not tomorrow, finally getting a chance to be productive with the project. Not sure of other OS's, though I have read about Netware and is something I would be willing to try also. 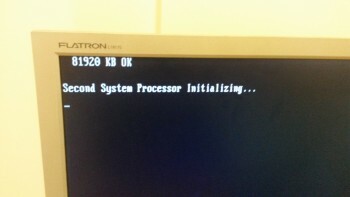 Dell Gxpro200, what type of system is this? Is this a server? Yea, the universe works in mysterious ways. Two Systempro's talking to each other... now there's a thought! I remember many IBM cases having protrusions like that, though most of those were desktop instead of towers. 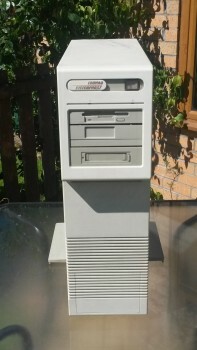 If an old PC looks this alien, it's got to be good! Fantastic! 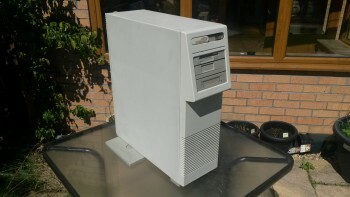 Amazingly I have finally found a case for my IBM 386 motherboard just this weekend! I have had to buy a complete machine to do so and payed far too much for it, but this should do the trick. 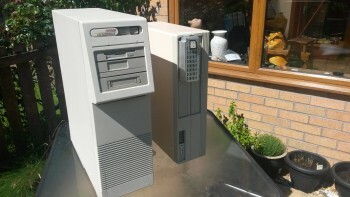 It's obviously not a perfect match but the form factor looks identical so all should be well, upgrading a Pentium to a 386sx!!! Thanks, why does everyone in this thread start them post with the word "thanks" ? the thread being system pro... amazing computers! 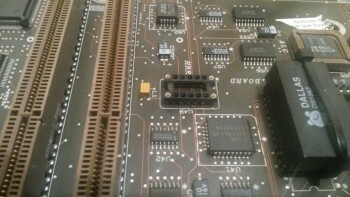 BSA Starfire wrote: Amazingly I have finally found a case for my IBM 386 motherboard just this weekend! I have had to buy a complete machine to do so and payed far too much for it, but this should do the trick. That case looks the balls! Not your usual run of the mill IBM case... plus I like the large logo top left, not something you see very often. Will need to look out your thread, is it all put together? An update to the thread... adding those long overdue Benchmarks! the vga speed here, 7kk+ pixel/s, means a 386 could spit over a 100 full 320x200x8bit screens every second? sths wrong here?